Thuren - 2014+ 2500 E-Brake Frame Bracket Thuren - Rear Endlinks for 2.5 Lift Thuren 6" soft rate coils are the perfect blend between soft ride, and performance control. Thuren Fabrication 2 inch linear rate coils. These coils are a perfect leveling solution for those who want usable suspension and not just a spring spacer. 3" Linear Rate Coil Thuren Fabrication 2 inch linear rate coils. These coils are a perfect leveling solution for those who want usable suspension and not just a spring spacer. 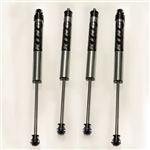 Thuren Shock towers 6.5" Black Powder Coated Thuren rear track bar kit vitrually eliminates that wiggle, and transforms the truck into a very precise handling vehicle. 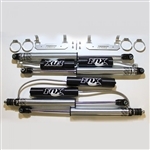 KING 2.0 IFP shocks are designed to be as smooth as possible on rough highways, small to medium square-edge bumps, high speed gravel washboard roads, and slower crawling type driving.